The magnesium test checks the magnesium blood level. The magnesium blood test measures the magnesium blood level. Why is a magnesium lab test important? The magnesium test is important for identifying a magnesium deficiency or magnesium toxicity. This Magnesium Test is a blood test. The magnesium test, also known as a magnesium blood test, magnesium level test and an Mg lab test, checks the magnesium blood level for a deficiency. Magnesium is an essential mineral in the body and is used in hundreds of chemical reactions in the body. Magnesium is primarily stored in bones. Magnesium helps muscles function properly and is important in blood sugar regulation. It also plays an important role in energy production, protein synthesis, immunity, and cardiovascular health. Low magnesium levels, or a magnesium deficiency, can occur from inadequate intake or absorption, long-term alcohol use, malnutrition or excessive diarrhea. Symptoms of a magnesium deficiency (hypomagnesia) include muscle cramping, trouble sleeping, loss of appetite, weakness and fatigue. High magnesium levels can occur from excessive magnesium intake from antacids or laxatives or if the kidney is not functioning properly. Symptoms of magnesium toxicity (hypermagnesemia) include trouble breathing, fatigue, and a depressed heart rate. This magnesium blood test helps measure the serum magnesium levels whereas the magnesium RBC test helps check the intracellular, or long term, magnesium stores in the body. Getting a magnesium test at a Quest Diagnostics lab near you is relatively simple. Once you order your test, you can get your blood drawn at the selected lab location. Once your magnesium lab report is ready, it will be available for download. 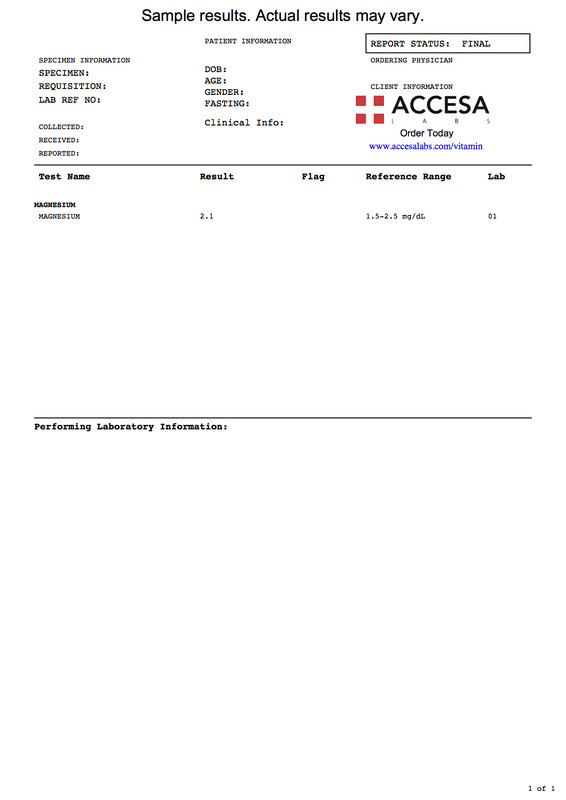 As can be seen on the sample magnesium lab results above, magnesium blood levels are reported as a numerical value and can be compared against the reference range provided by the lab. This magnesium lab test is a component of the more comprehensive mineral test panel. Magnesium Test at Guaranteed Prices.